Cambridge University & Melbourne Univeristy leap together after co-winning the Best BioBrick Part award. Berkeley playfully poses with their BactoBlood. The team was one of the 6 finalists for the grand prize. A mass of anxious iGEMMERS join a spontaneous dance on stage while waiting for the final Grand Prize decision from the Judges. 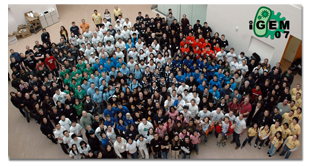 The 2007 iGEM Jamboree officially concluded on Sunday November 4. Congratulations to all of the participants for such an outstanding job. And congratulations to the Peking team for taking home the iGEM BioBrick trophy. To see the results of iGEM 2007 and view all of the team presentations in video and slide format, take a look at the results page. Welcome to the iGEM.org and iGEM 2007 wiki - it's iGEM07's online home and the place that all the iGEM teams share the details of their projects with the community. This site will split into the iGEM07 site and the iGEM .org site soon. You might also want to visit the Registry, the iGEM2007.com registration page, or OpenWetWare. Start a team at your school, and then stay involved as an alumni. Or volunteer and help us run the jamboree - we need lots of help! Or considering partnering with us as a Sponsor. So come share our excitement, and get involved today! Sign up for iGEM 2008 mailing lists. Hundreds of undergraduates all over the world spend their summer making Synthetic Biology a reality by participating in the annual International Genetically Engineered Machine competition. Check out our videos about getting started with iGEM, the principles of Synthetic Biology, and how to use the Registry. Continue to the podcasts page to learn more about and view the short vodcasts. Certain BioBricks not working as they should? Please let us know here. This page was last modified on 8 September 2008, at 01:38.